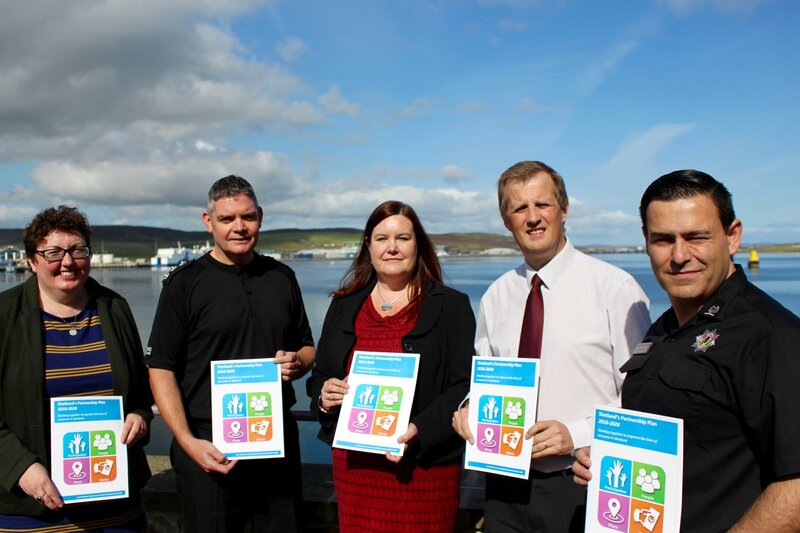 A NEW ten-year plan for positive change in Shetland which brings together agencies including the council, health board and the police has been described as “very ambitious” by those involved – but there is optimism its targets can be achieved. Among the long-term goals in Shetland’s Partnership Plan is to create 800 new jobs in the isles by 2028, cutting levels of fuel poverty in half and increasing the number of households earning enough for an acceptable standard of living. It also wants to see less people drinking at harmful levels, more islanders engaging in physical activity and a greater percentage of people feeling involved in their community. The plan was formally launched on Tuesday morning in Lerwick as the five lead agencies – Shetland Islands Council (SIC), NHS Shetland, Police Scotland, Highlands and Islands Enterprise and the fire service – came together to promote the plan to local media. Its key focus is to “reduce inequality of outcome in Shetland” and how to tackle the issues which “mean some people and groups have a poorer quality of life than others”. Among the nine other statutory partners are SportScotland, VisitScotland, ZetTrans, University of the Highlands and Islands and Scottish Natural Heritage. SIC chief executive Maggie Sandison described the plan as “very ambitious”, but one that provides a fresh focus for the isles’ organisations and agencies. The content and targets within the plan were devised from evidence gathered from the place standard survey carried out across Shetland in 2016 on areas like population, health, crime rates, income, poverty and education. Agencies working together in Shetland is nothing new, with Shetland Partnership Board bringing organisations together for a number of years, but Sandison said she wasn’t sure if the “structures and systems” which had been in place best supported partnership working. NHS Shetland chief executive Ralph Roberts said the health service has long worked with other organisations for positive change. “This feels to us an absolutely natural and right thing to do,” he said. SIC chief executive Maggie Sandison acknowledged that there is “less resources and less capacity” for public bodies in the current financial climate, but “we must address this by working together”. She reiterated that the Scottish Government’s proposed islands deal is a major component of trying to secure 800 jobs for Shetland, pointing to opportunities in decommissioning, the space industry and house building. Shetland area commander chief inspector Lindsay Tulloch said the goal of the police was to tackle root causes of offending such as drugs, alcohol and domestic violence. “Shetland is a great place to live, but we want to promote that,” he added. Area manager for the Northern and Western Isles Iain Macleod said that the fire service links into the plan in relation to its work in prevention, with other agencies able to point them towards vulnerable people. He praised the plan for being “clear and concise” – and said it was “exemplary” in comparison to other community planning documents in Scotland. Shetland manager for Highlands and Islands Enterprise Rachel Hunter said economic prosperity is “intrinsically linked” with inequality in society. “What we have to do is align our services much more closer to the aspirations of the Shetland Partnership Plan,” adding that at the heart of the project is “making Shetland a better place to live, work, study and be in”. Sandison admitted that if any of the targets are not met then the partners have to be “brave enough” to acknowledge this and “try something different”. The agencies will be able to scrutinise each other’s work, while Shetland Partnership will also monitor progress and evaluate performance. In the first year, partners “will be working to align existing plans, strategies and partnerships”. The plan recognises that “strong leadership and effective management” will be needed to maximise the resources available to the partnership and individual agencies. Hunter also said historically there have been some “stubborn challenges” for Shetland, but the plan gives a “platform for innovation” and provides a new focus. Roberts also said that in the past partners may not have been as good at working together. “That is something we need to get better at doing,” he conceded. Hunter added that the plan was “started from a very different place than it did in previous incarnations of community planning”, saying that it allows partners to start from a “clean sheet”. While Shetland Charitable Trust – which provides millions each year to organisations and projects in the isles such as the recreational and arts trusts – is not listed as one of the plan’s 14 statutory partners, Sandison said the charity is still involved, as is the voluntary sector. So what could Shetland look like in 2028 if the plan is a success? “What we want to see is individuals thriving,” Sandison said, “but also that our communities are thriving”. Macleod said that the “final part of the jigsaw puzzle” is communities feeling like they are being listened to and are involved in the decision making process. This will involve closer participation with community councils, for instance, which will be able to hold the partnership to account.